Sage Lace, Minty Pleats and a Giveaway! I have not been sewing separates for sometime and I can’t even recall the last time I sewed in pastel colors. This outfit happened purely out of my intrigue with different fabrics, specifically lace, silk organza and pre-pleated. I’ve sewn with lace but have never used silk organza as underlining though I’ve heard and read so much about it. This sage lace fabric has been in my stash for years and I found the perfect coloured silk organza for it around a year ago. But, what got this project going was the pre-pleated fabric. My intrigue with pre-pleated started here, with the fancy pleated dress I saw in a store. While I have not successfully acquired any fancy pleated fabric, I realized sewing with such fabrics could be a completely new ball game. I decided to give this fabric a trial run after I found this pleasant mint colored fabric with a subtle shimmer. After receiving it, I realized I had *gasp* absolutely no idea how to store it without flattening out the pleats. I decided to test the fabric with my machine ASAP to see if I can get the pleats to behave (stitched without flattening out) by sewing the easiest skirt possible. Yes, one with a matching wide mint colored elastic band. It turned out easier than I imagined. I bought 2 meters of the very wide fabric and had sufficient to cut the piece into half down the middle of its width. One piece was used as the main fabric and the next as the lining as the fabric was rather sheer. For the back seam (both layers), I followed Sandra Betzina’s tips – flattening out the vertical pleats by pulling the fabric flat to avoid catching folds of nearby pleats. This was repeated for both layers and worked magically. For stitching the right side of elastic and right side of pleated fabric together, I sewed the lining layer first by pushing the pleat folds together and sewing over. It can get a little tedious because you have to keep checking, pausing, pushing the folds, stitching repeatedly but the end result is worth it. I repeated this process with the top layer while making sure I do not catch the lining by mistake. The skirt was completed in a few hours. What about the hem? Turns out, most RTW pleated skirts are hemmed before the fabric is pleated so for home sewers, it’s important to select pre-pleated fabrics where colors and pleats run from selvage to selvage as it is best to leave the hem raw. If you are interested to sew pre-pleated fabrics, another useful resource is Claire Shaeffer’s Fabric Sewing Guide here. I am definitely keen to experiment more and see how the fabric might work on a dress. The blouse with back buttons, cut out front, front and back tucks which created a slight bloused effect was made from vintage McCall’s 6256 (view B) which I believe is a 1940s sewing pattern. On hindsight, this lace fabric is probably not the best material for a garment with cut out details as it has a tendency to pull in the direction of the stitch and add bulk around the cut out area. To minimize the pulling, I hand-stitched the facings in place, instead of topstitching them. The neck binding was also hand-stitched. In contrast, the silk organza was a dream to sew and I love the feel of it next to my skin. The fabric provides fabulous support to the lace without increasing bulk and I was truly impressed. It was the perfect fabric for the neck binding too. I really like this blouse pattern with its cut out details and will gladly sew both view A and B. And now, info on the lace giveaway! The first piece of lace fabric happened to be exactly the same as the main fabric used for my Ivory Kaftan blouse below. I didn’t realize that they were the same until I compared them. The piece is 2 yards with small corner cut. I only used one yard for my blouse so this piece should be sufficient for a blouse, skirt or a short shift dress. This lace is woven and easy to sew. The second piece is a white stretch lace with floral and black tartan print. The piece is 2 meters and perfect for making a stretch lace top or the lace cardigan pictured below. Next month, hubby and I will be celebrating our 15th wedding anniversary. I’ve been thinking of sewing him something. I went to the Spotlight sale today and ended up with 3 ladies and 1 girls patterns. The men’s selection was disappointing, mostly PJs or costumes. So, to participate in this giveaway, all you have to do is to let me know which is your favorite men’s sewing pattern and the link to it ( if any). Indicate if you prefer the ivory or printed lace as there will be a winner for each. As usual you double your chances if you are subscribed to my blog. Re-tweeting this giveaway on twitter will get you one more entry and so will blogging about it. The winner will be chosen randomly by the higher power at random.org . Giveaway ends Monday, 19 August 2013. This giveaway is international, I’ll ship the fabrics to the winners anywhere around the world! P/S: My new post on my sewing journey and upcoming plans is up on The Sew Weekly Reunion blog. Do drop by if you can:) I’m going to relax and enjoy my long weekend here in Singapore before starting on my Reunion project next Monday. Have you heard of thread theory? I like their cardigan pattern here: http://www.threadtheory.ca/product/newcastle-cardigan – also love the ivory lace, and thanks for the hint on hemming pleated fabrics! I really love the ivory lace, what you made out of it is so pretty! Thanks for the giveaway & the great blog posts. I follow my email too! I’m far from an expert on men’s patterns since I don’t even get around to hemming my boyfriend’s pants, but I do love that ivory lace! I follow your blog on bloglovin’ by the way! Your outfit is very pretty! I love the colours, and I especially like the pleated skirt. I follow you via bloglovin’ and I’d love the printed lace. Thanks for the give-away. I use the Hot Pattern #HP2002 – Coal, Iron, and Railroad shirt for my husband. He really likes it. Your outfit is beautiful. I especially love the blouse. You look so elegant. OMG the ivory lace is so pretty! For some reason I have a hard time finding good lace to make clothes out of, but I just adore this fabric!!! My recommendation for menswear would be the Avacado Hoodie by disparate disciplines – it”s not anything I’ve seen elsewhere and it can be made in a light fabric for summer or heavier for fall/winter 🙂 I have a hard time finding good men’s patterns too, so I hope this helps! I would love to enter this giveaway, both fabrics are delightful, I would be very lucky to win either 😀 I am a follower too through bloglovin. I love how your skirt turned out, I have very recently tried working with pre-pleated fabric for the first time also and found it fairly easy but then after wearing the garment for the first time, found the fabric to have stretched and pulled apart at the seams. it was very disappointing. I am going to check out those links you suggest and see if I can pick up any more tips. The ivory lace is beautiful, and would be my choice. Hi Adey, your outfit is stunning! The colour really suits you, and co-ordinates beautifully with your web page:) Is there something in the air here? I made 2 pleated tops this week using a Drape Drape pattern, and I just used my rotary cutter to neaten the neckline, and hems. I agree with Mary M, the Jedidiah pants from Thread Theory are a winner. Haven’t made them up yet, but on my list to sew for my husband. And I think the stretch lace would be great used for sleepwear, don’t you? Enjoy your loong weekend, and congrats on your upcoming anniversary. @vintagefrills: Thank you so much! The 40s blouse pattern is lovely, will love to see your version! @Kay: thank you so much:) delighted that u like the outfit! @Alessa: thank you! So happy you like the colors and the skirt. Thanks so much for the suggestions! I have always bee curious about pre pleated fabric, so it was interesting to read about it from you. The ivory lace is really beautiful, I would love to win it! I have sewn mccalls 6044 for my boyfriend, and with a few modifications, it’s a decent pattern. I recently came across thread theory and they have great menswear patterns. I really want to make the Jedediah pants for my boyfriend. 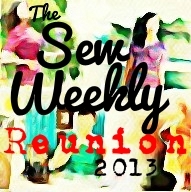 Good luck with the sew weekly reunion sewing! I love the blouse you made and that neck finish is fabulous and so neat. Congratulations on your 15th anniversary! I would love to make a blouse with that ivory lace. As for the pattern suggestion, given your great skills I would make JEDEDIAH PANTS or similar chino pants. I haven’t sewn much for my husband though! I love lace, and I love pleats. Your outfit is delightfully gorgeous. As far as the fabrics go, I LOVE the plaid, lace, floral combination. I’m a big fan of the juxtaposition of different “levels” of design. High-low or whatever. I signed up to follow your blog just now—haven’t received the confirmation email yet, but I’m sure it is coming. Your blog is a new discovery for me. I love the pleated skirt, I have been curious about some of the prepleated fabric I have seen. I love the color choice also. I would prefer the ivory lace. Yes, I follow your blog. I will link your post to my blog on Friday. @Jennifer: Thank you so much. Yes, all these different fabrics are just so interesting! My favorite men’s pattern is a vintage button-down shirt pattern that I’ve made a couple of times: Butterick 4712. Also, congrats on picking up enough new followers to celebrate. I follow on Bloglovin’, and I’d be excited to win either lace. Thanks for the chance, and I’m looking forward to the Sew Weekly reunion! You have created gorgeous things since beginning to sew ~ congratulations on your overcoming that original mis-adventure! I love your outfit! I would never try sewing anything with pleats, but I would like to try a blouse pattern.. I think the key to making men’s clothing is to look for classic style lines, but get different results through fabric. This one is very stylish, but could be made more casual through fabric choice, print, short sleeves, or even Bermuda shorts! I just discovered your blog, Adey. Your work here is stunning! Thank you for sharing! Hi! Where did you find that beautiful pre pleated fabric? I’m thinking of making a dress for my daughter and I’m not having much luck with my online search. Thanks! Gorgeous skirt and top!